More audience members than ever before will be able to enjoy the Adelaide Fringe thanks to new accessibility initiatives being introduced for the 2019 festival. For the first time, Adelaide Fringe is partnering with Deaf Can:Do and the Royal Society for the Blind (RSB) to help raise awareness of the services available to festival-goers who have access requirements. Adelaide Fringe Director and CEO Heather Croall said new initiatives included a 2019 Accessibility Guide and online search filters for shows with Auslan interpretation, open captioning, hearing loop, audio description, relaxed performances and tactile tours. “We want everyone to experience the magic of attending a show at the Adelaide Fringe, and we’re working with venues and key organisations to make sure our festival is as inclusive as possible,” Ms Croall said. Following the success of their introduction to the 2018 festival, this year’s Adelaide Fringe will again offer audio-described tours for two of its flagship events – Tindo Utpurndee: Sunset Ceremony and Yabarra: Gathering of Light – with help from the Royal Society for the Blind. Royal Society for the Blind Executive Director Robert Dempsey said his organisation was proud to be part of the 2019 Adelaide Fringe as an official Accessibility Partner. “We have long supported an ‘access for all’ philosophy and are excited to be working with the Fringe to identify opportunities that will improve event services and facilities, reduce barriers and increase access and inclusion for all. There are some great new initiatives to be introduced for this year’s event that will ensure even more people will have the opportunity to experience a show. We believe our exciting new partnership with the Fringe sets a great platform to build upon in future years,” Mr Dempsey said. Adelaide Fringe’s partnership with Deaf Can:Do includes the presentation of an inaugural Access Award at the 2019 BankSA Fringe Awards for the most accessible Fringe experience. Deaf Can:Do also helped spread the word about Adelaide Fringe’s survey of people who are deaf or hard of hearing to identify which shows they would like an interpreter for. Following this survey, Adelaide Fringe selected seven events that would benefit from having Auslan interpretation and has provided funding to make this possible. Deaf Can: Do has been asked by Fringe artists to provide Auslan interpreters for more than 10 Adelaide Fringe events this year to give the deaf and hard of hearing community an increased opportunity to enjoy the festival. Deaf Can:Do Client Services Manager Debbie Kennewell said her organisation was proud to be partnering with Adelaide Fringe to “celebrate unique diversity, remove barriers and increase access for all”. “There are many people with language barriers who aren’t able to access things in the community that they should be able to access. That’s why we are committed to building inclusive communities, and accessibility is a huge part of this,” Ms Kennewell said. 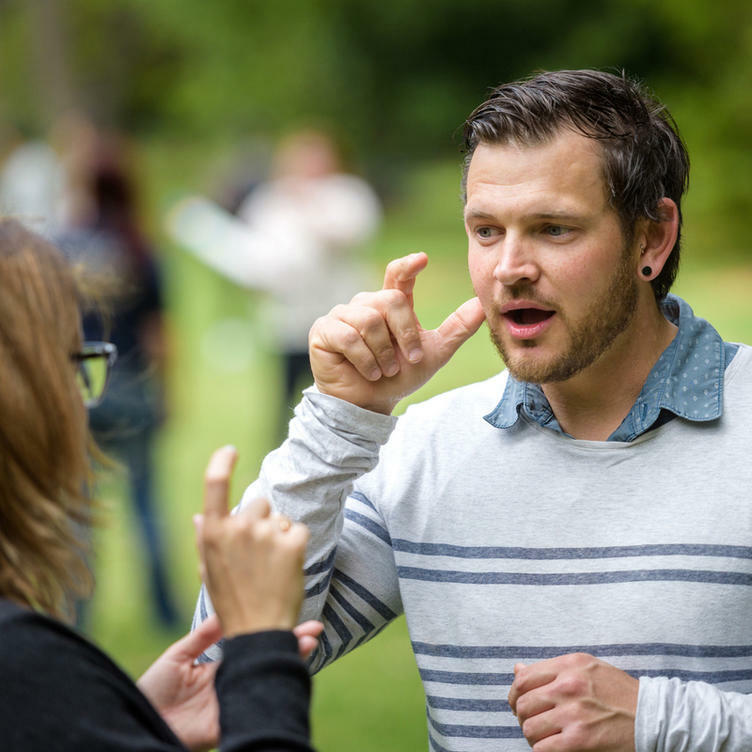 Deaf Can:Do is even hosting two events during this year’s festival including Come and Try Auslan with Deaf Can:Do at the National Wine Centre, where attendees will learn about finger spelling and basic greetings using Australian Sign Language. The event has proven to be popular with festival-goers, with tickets already sold out. Tickets are still on sale for its other Fringe event, Auslan Games and Storytime with Deaf Can:Do at the National Wine Centre on February 22. In addition to these partnerships, Adelaide Fringe will for the first time conduct a venue audit in 2019 to collect detailed access information with the aim of all Fringe venues having publicly available accessibility ratings for the 2020 festival. To achieve this, 20 volunteer Access Champions will conduct surveys to help develop a tiered rating system modelled after the one used for the Edinburgh Festival Fringe. The Access Champions will also support patrons with access needs at key venues. The seven events that Adelaide Fringe has commissioned Auslan interpretation for in 2019 are: Tindo Utpurndee – Sunset Ceremony, Hans: Like a German, Rouge, Discharged! A Nursing Cabaret, The Scientific Bubble Show, Fringe Talk Show and Judith Lucy Vs Men. The 2019 Adelaide Fringe will be held from February 15 to March 17. For more information, visit adelaidefringe.com.au.